Today I went to my computer graphics class. Only 3 more days and it's complete. Right now I'm designing packaging for a toy (the class project). I will be signing up for another Web Design class, starting August 25th, in the evenings. 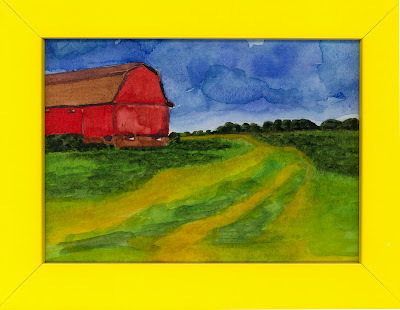 I took out my watercolors and attempted to paint a farm scene, Teresa took a photo of in Ohio. I'll have to try it a few more times. It's about 5 x 7, in an Ikea frame. Next I used a scrap of watercolor paper from Shannon's leftovers. It was the good paper. It's a little one, 8.5" x 2". Busy hands are happy hands. I walked Lili all the way across the street to visit the little boy, Chochi. He loves petting Lili and she wanted to get outside. Her right front leg hurts her so much, that was about as far as she could go. All is well in the neighborhood.